It was off to a fairly underwhelming beginning, delayed in a bitterly cold and threadbare Hanoi Airport due to adverse weather conditions (airport speak for smoke in the airspace above Laos). Dressed as warmly as possible with all the clothing I could muster from my carry-on luggage, I started to regret my decision not to travel into Laos the hard way. Shunning my backpacking roots, I had decided to splurge on a flight and thereby bypass one overnight train and two arduous bus journeys. Oh yes, for the two hours I was stuck at that dreadful airport in Vietnam I actually wished I had travelled overland to Laos. 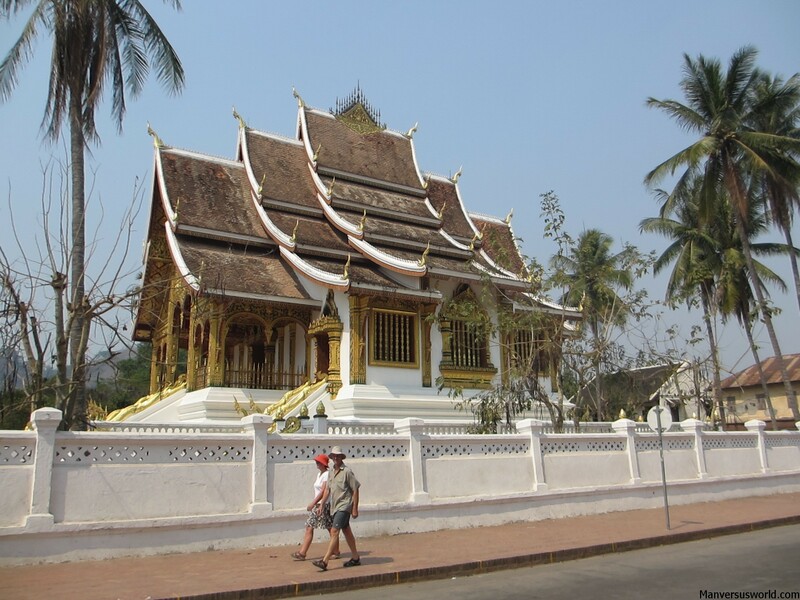 I arrived in Luang Prabang just before midday, only two hours after I was scheduled to arrive. As I made my way off the plane and across the tarmac, struck dumb by the sheer heat of the day, I was dreading the thought of having to jump through all the bureaucratic hoops required to get my Laos Visa. I shouldn’t have worried. Far simpler than the rigmarole involved getting a Vietnam Visa at the border three weeks earlier, I merely joined two short lines, paid $30US and entered the country. And at this point in the story I would just like to point out that I was delighted to find out that it’s actually $5 cheaper to enter Laos as a Kiwi citizen than on my British passport. Well pleased was I, to finally be travelling as a New Zealand citizen once more (no offence, Great Britain). When I arrived in Vietnam three weeks earlier I had two options: catch the public bus into Ho Chi Minh City or take my chances with a taxi and face the very distinct possibility of being ripped off. Because I always do things the hard way (a running theme here at Man vs World) I chose the public bus – and I must say on that particular occasion it turned out to be the right move. In Laos, however, I was spared the potentially catastrophic decision of deciding by which means to get into town by the provision of a ticketing system whereby I simply chose from a menu which method of transportation I would like to take me into town and then pay the designated price. It really doesn’t get much easier than that. Before you could say “Please turn your meter on, Vietnamese taxi driver” I was cruising into town in the back of an air-conditioned taxi van. 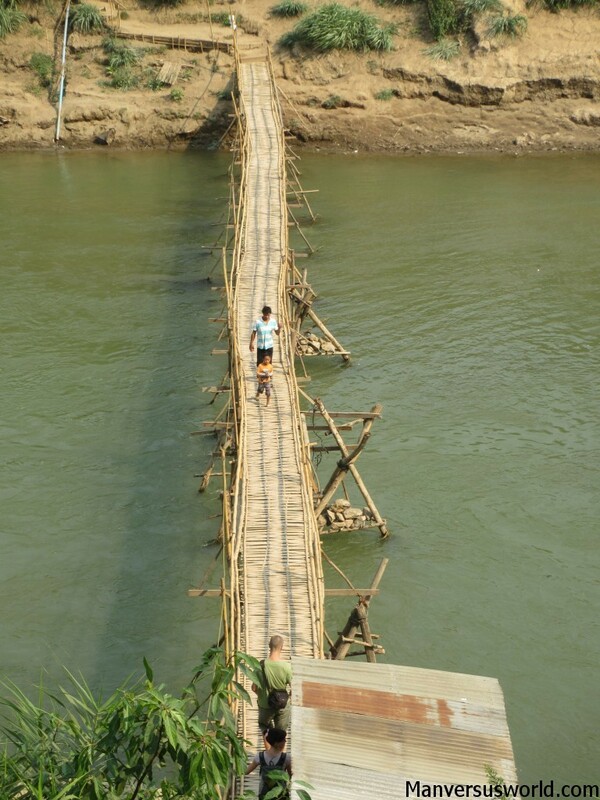 The ease of my traverse into Laos didn’t stop there. 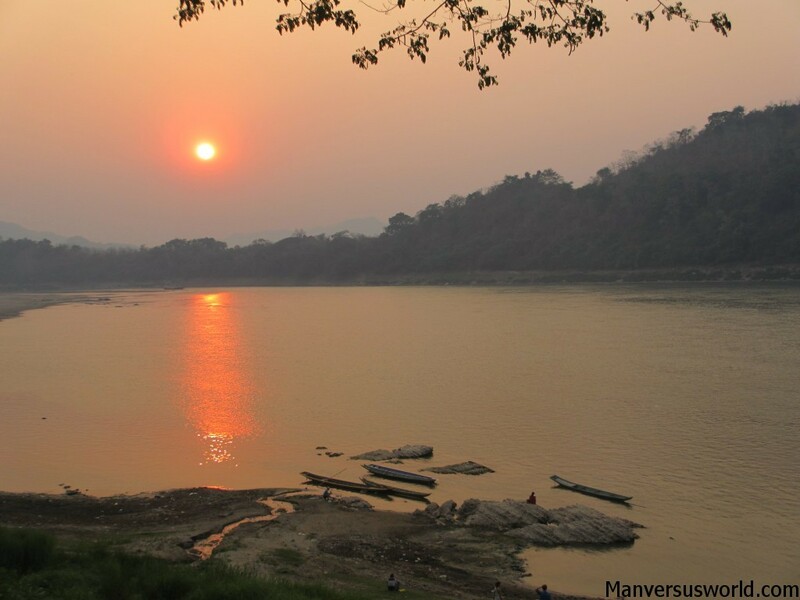 Not only did the taxi driver not try to screw me where it hurts a backpacker most – in the wallet – but he pointed us in the direction of a swell row of Luang Prabang guesthouses. 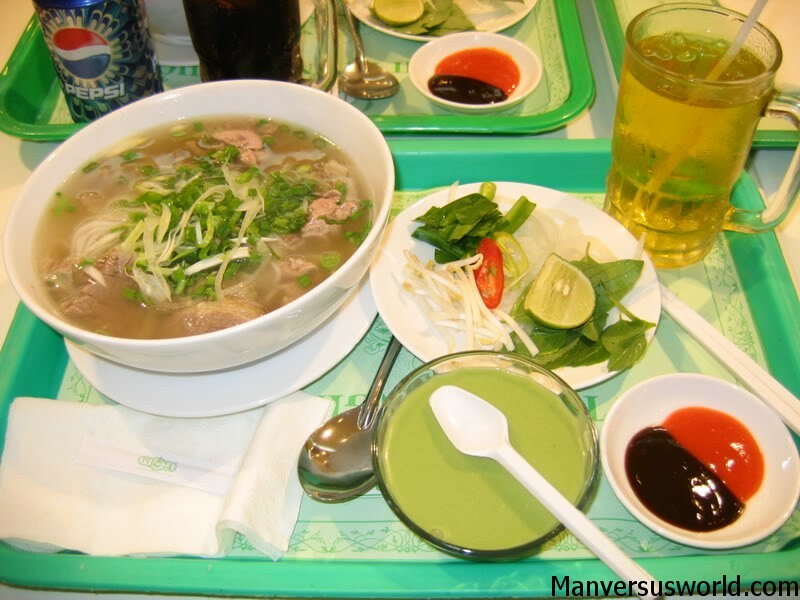 Easy peasy lemon squeezy, as the Vietnamese sometimes like to say to Western travellers. Walking from guesthouse to guesthouse was made easy by the lack of scooters trying to maim me every time I crossed the road. Not long later and I had checked in to a perfectly clean and nice Laotian guesthouse. To be fair, it was a little more expensive than what I had been willing to pay in Vietnam but that’s how they get you in Laos: they’re disarmingly casual about such formalities as the price of a room per night. 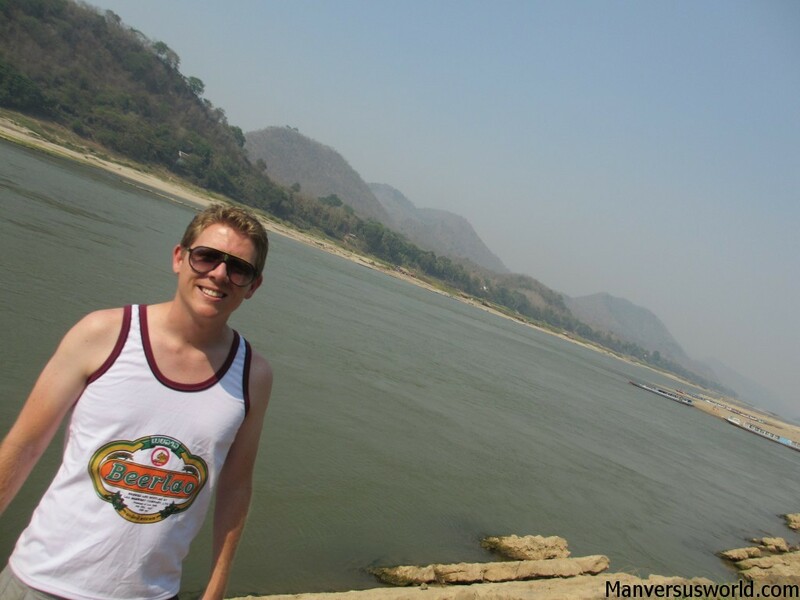 That afternoon I enjoyed my first, second and third ever Beerlaos while I watched the sun set over the Mekong. 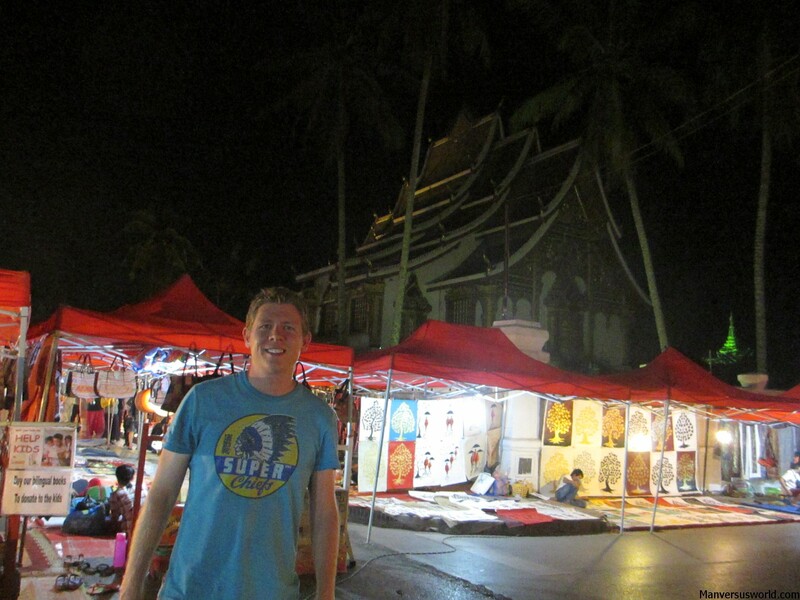 And after that I visited Luang Prabang’s fantastic night market and did as backpackers do and bought a singlet. So, as love blooms between this backpacker and the jewel of the Mekong I can’t help but wonder whether this will turn out to be the special kind of love that redefines your outlook on life. Or will this be another love affair that ends in bitter divorce. Only time will tell. But there is one thing that I do know for certain: I love Luang Prabang. Haha, sounds like a plan! I’ve heard the road is a bit of a nightmare; that’s why I flew by plane. But now I feel a little bit guilty that I missed out on a quintessential backpacker experience in Laos! Lovely story and yes, you should have taken the arduous road to Luang Prabang. I have never been to Luang Prabang which makes it my must-to-do destination from Hanoi because when I came in from the Philippines to Vietnam, I passed by directly to Ho Chi Minh City en route to Cambodia. The photos are impressive and the one you took below, that photo (though, with a monk in it) appears on New York Times haha 🙂 same exact place. Haha, that’s nice to know that the New York Times and I think a like! You have to love those travel days you think will be so difficult and then they are a piece of cake! Love that last picture! Thanks, Suzy! I always find it’s when I’m preparing for the worst travel day ever that it turns out to be a good one.